I got up and walked to the van holding my arm and we went home. I instantly sat on the couch and started poking around on my belly to see if the baby would move for me. I drank some juice and waited a few more minutes. Nothing..so we decided if for anything else we needed to head to the ER to get the baby checked out. I then took off my sweatshirt to take a look at my arm and my elbow area was starting to swell quite a bit already. It has become hard to bend my arm because of the swelling and it was starting to throb. From past experiences...I knew this wasn't the best sign! We called Shannon and asked him to come over and stay with our boys and get them to bed and we headed off to the ER. They checked out the baby's heartbeat and it all sounded great. He also started to move around a bit as well and by the end of our ER stay was pushing and moving more back to normal. So I felt much better! My arm continued to swell. They took xrays and we got checked into a room in the ER. They started an IV on me and gave me two doses of morphine. Boy was that an experience. We were told at first they thought I had broken my arm in 3 spots. The radius, humerus, and the olecranon (the tip of my elbow). They said the good news it wasn't displaced but they were having an orthopedic surgeon take a look at my scans from home. they came back later and said after having 3 doctors look at it in the ER they think the two bone fractures were old breaks. But they continued to tell us at least twice throughout the night I would need some type of procedure (meaning surgery) to fix the olecranon. Of course I cried some just knowing what that might entail. I had broke that same bone in 5th grade and had surgery and wires put in my arm so I was just relating it back to that experience. And of course I had broken this arm again after that just due to my OI and having brittle bones. So this was the 3rd time. 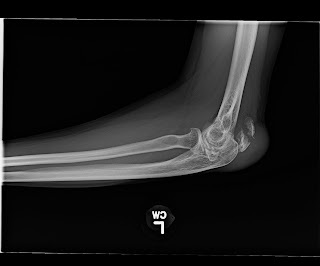 see those two extra pieces of bone by my elbow..interesting!! So we were definitely thinking surgery when we walked into the office and thought it was just a matter of "when" but were elated to find out that may not be the case. I am in a smaller cast/splint that I can take off to shower now YAY but must wear the rest of the day. I still can't bend my arm but have use of my fingers and hand. My hand and wrist are swollen but usable but I do need to watch how much I use it, but it was definitely sore and more swollen last night after doing more with it yesterday. My arm is continuing to get more dark purple by the hour but hoping that means it is at least healing. We are going for a 2nd opinion on Monday to Triangle Orthopedics to see their hand, wrist, and elbow specialist. I have gone there before and really enjoyed that practice. I just want to make sure waiting on the elective surgery will not cause any future problems for me and that this doctor also agrees with the prognosis and treatment this doctor has me doing right now. I really would like to get at least the mobility that I had before back to be able to use my arm as "normally" as I can..well what has been normal for me for almost 20 years. I would have to say 2011 has given us some emotional moments.. finding out we were pregnant (not super stressful but more like whoa that was quick! ), tornado hitting our house, moving out, some other family stuff that has been going on, and now a broken arm. I am confident it ending with a new precious baby boy in our lives will be great but MAN am I ready for 2012 to start and hopefully be less crazy :) I may have set a new record this year with how many days I have cried total!!! You are a great mom! You broke your arm to keep from dropping Teags - that's love right there! :) Thanks for the updates and details! I am so glad you might not need surgery and the arm is starting to heal. I sure would have cried quite a bit had I been in your shoes. That new baby of your sure has a brave mama! I hope you are feeling well these last few days of your pregnancy! I know you are all very excited to welcome your new precious little boy into your family!! I hope everything goes well with the delivery! Because of logistics, we choose to take Brayden to Abilitation's Children's Therapy for his evaluation. Since Project Enlightenment is downtown and we live north of 540 off Falls of Neuse, it would be quite a trek to PE if Brayden did need weekly therapy. Plus with me going back to work in a few weeks, I just didn't see how it would be possible for me to get him there. Albilitation's is co-owned by my Godsister & is right in our neighborhood (we could walk if we wanted to). The therapist that we saw, did notice Brayden's stuttering 9 or 10 times in the 45 minutes we were there. Most of the time, it is at the beginning of a word, which I understand is normal, but then occasionally, he get stuck in a sentence & can't get it out. Because he doesn't seem frustrated by the stuttering at this point and it isn't specific sound combinations, the therapist thinks that it is all developmentally normal at this point. She gave us a couple of suggestions for ways to help at home (slow down our talk, repeat slowly & clearly the word/sentence that he was stuttering, and giving encouragement such as "Mommy/Daddy is listening" when he seems to get stuck). Since she thinks it is still developmental at this point, we are going to try these suggestions through the rest of the year & then decide if we want to start therapy if he doesn't seem to be getting any better. So far, I am not seeing much difference, but it has only been a couple of weeks so it may take a little time. How is Brayden doing with therapy? Take care! Can't wait to see photos of your newest family member!